If you are unfortunate enough to have not been born in the green and pleasant land that is known to all as England, then your first thoughts of Her Royal Highnesses' kingdom is likely to be the City of London. More specifically, Buckingham Palace, St Paul's Cathedral, and the London Eye! 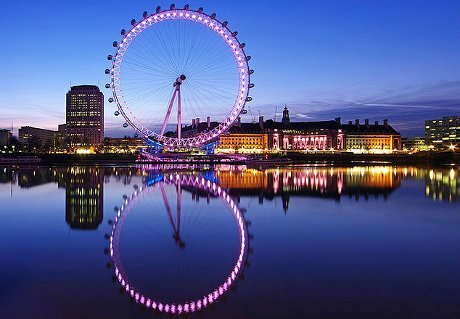 Situated on the banks of the River Thames, the London Eye is the tallest Ferris wheel in Europe, visited by over 3.5 million people annually. Although a newcomer to the historic London Skyline, the London eye is the most popular paid tourist attraction in Great Britain. When erected in 1999, it was the tallest Ferris wheel in the world at a height of 443 ft, until surpassed first by the 520 ft Star of Nanchang in 2006, and then the 541 ft Singapore Flyer in 2008. However, it is now described as 'the world's tallest cantilevered observation wheel, as the London eye is supported by an A-frame on one side only, unlike the Nanchang and Singapore wheels!. 1. 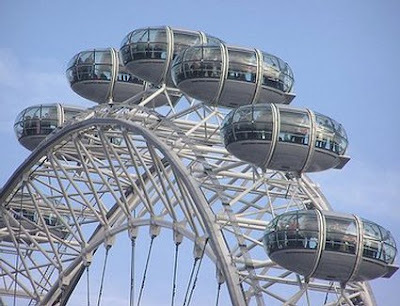 The wheel has 32 sealed and air-conditioned ovoidal passenger capsules, designed and supplied by Leitner-Poma, are attached to the external circumference of the wheel and rotated by electric motors. 2. Each capsule represents one of the London Boroughs, weighs 10 tonnes and holds 25 people who are free to walk around inside the capsule, though seating is provided. 3. The wheel rotates at 26 cm (10 in) per second (about 0.9 km/h or 0.6 mph) so that one revolution takes about 30 minutes. It does not usually stop to take on passengers; the rotation rate is slow enough to allow passengers to walk on and off the moving capsules at ground level. It is, however, stopped to allow disabled or elderly passengers time to embark and disembark safely. 4. 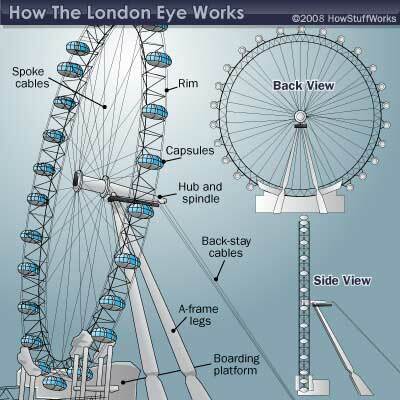 The rim of the Eye is supported by tie rods and resembles a huge spoked bicycle wheel. The lighting for the London Eye was redone with LED lighting from Color Kinetics in December 2006 to allow digital control of the lights as opposed to the manual replacement of gels over fluorescent tubes. 5. The wheel was designed by architects Frank Anatole, Nic Bailey, Steven Chilton, Malcolm Cook, Mark Sparrowhawk, and the husband-and-wife team of Julia Barfield and David Marks. 6. Mace were responsible for construction management, with Hollandia as the main steelwork contractor and Tilbury Douglas (now known as Interserve) as the civil contractor. Consulting engineers Tony Gee Partners designed the foundation works while Beckett Rankine designed the marine works. 7. The wheel was constructed in sections which were floated up the Thames on barges and assembled lying flat on piled platforms in the river. Once the wheel was complete it was lifted into an upright position by a strand jack system made by Enerpac. It was first raised at 2 degrees per hour until it reached 65 degrees, then left in that position for a week while engineers prepared for the second phase of the lift. 8. The total weight of steel in the Eye is 1,700 tonnes (1,870 short tons). 9. The project was European with major components coming from six countries: the steel was supplied from the UK and fabricated in The Netherlands by the Dutch company Hollandia, the cables came from Italy, the bearings came from Germany (FAG/Schaeffler Group), the spindle and hub were cast in the Czech Republic, the capsules were made by Poma in France (and the glass for these came from Italy), and the electrical components from the UK. 10. 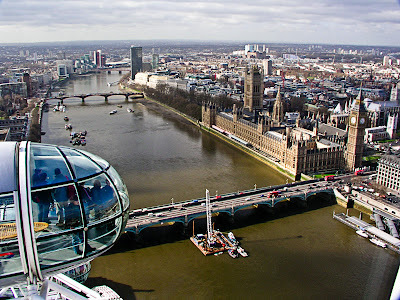 The London Eye was formally opened by the then Prime Minister, Tony Blair, on 31 December 1999, although it was not opened to the public until 9 March 2000 due to technical problems. Since its opening, the Eye has become a major landmark and tourist attraction. 11. Since 1 January 2005, the Eye has been the focal point of London's New Year celebrations, with 10-minute displays taking place involving fireworks fired from the wheel itself. 12. 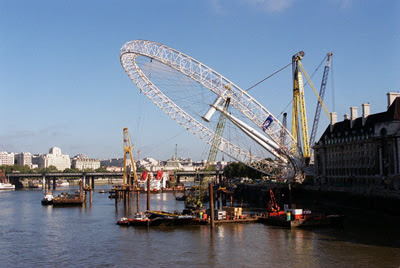 On 5 June 2008 it was announced that 30 million people had ridden the London Eye since its opening in March 2000.